If you are looking for information on the The Fun Ones franchise business opportunity, The Fun Ones franchises or The Fun Ones franchising, then you have come to the right place. 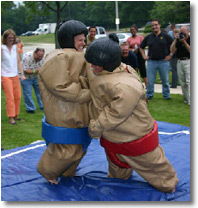 Interactive inflatables is a fast growing industry which is propelling party rental sales to all-time highs. The inflatables are not just for backyard parties, they are becoming the cornerstone at company picnics, youth groups, fund raisers, festivals, trade shows and schools. It's almost impossible to drive around on a weekend and not spot a Bounce House, Slide or other Inflatable Play Structure. But why is their popularity growing by leaps and bounds? 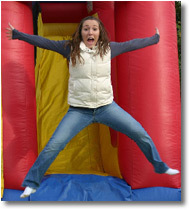 The reason is simple; children and adults love the fun and physical activity that inflatable play structures provide. They keep kids busy through the entire time of their event so the adults can relax and enjoy the time with family and friends, and that's what it's all about. Everybody wins... and so can you! The Fun Ones concept is different from other party equipment rentals with its custom all-inclusive packages and emphasis on convenience. As a franchisee with The Fun Ones you can offer a wide selection of equipment, carnival games, obstacle courses, dunk tanks, fun food machines, entertainers and more. There's something for everyone! With a convenient and service orientated way to rent party equipment that is always safe and reliable; people will look to you and The Fun Ones for their own ultimate party experiences. The Fun Ones Business Opportunity Is Big, Fun And Flexible. Be a part of a huge and growing industry. Set up your office and storage needs in about 3,000 square feet of light industrial park space and you're ready to party! The Fun Ones is appealing to a wide variety of people and party-goers, including families with children, youth organizations, groups of adults, and businesses of all sizes. As you establish your customer base of residential and corporate accounts, you'll be able to provide convenience, quality, and fun for a wide variety of events including company parties, school carnivals, fun fairs, fundraisers, birthday parties, church/religious events and more!